Note: This post was originally prepared for Lori Gosselin’s blog series called, The Life of a Blogger. Well, in the midst of editing, I got caught up with other things and neglected to send it off. And since the series ended a year ago (oops! ), I thought I would go ahead and publish it here. Waste not, want not, as they say, right? If nothing else, it may interest you to know how blogging has affected me personally. And you never know, maybe it will inspire you to start a blog of your own! Are you a happy blogger? There are certainly aspects of blogging that can have the opposite effect. There have been times when self-imposed deadlines and frustrating blog stats and disappointing comment counts have led me to wonder if it was all really worth the time and effort. Reason #1: I love to write. The creative process of writing and editing, of perfecting a sentence, crafting a paragraph, creating the tempo and meter and rhythm of an idea is a deeply rewarding process, a process that gives voice to my creativity and imagination, allowing my artistic side to have an outlet. Reason #2: I love researching, thinking through a concept, then putting fingers to keyboard to construct the article that conveys the message I want to share. I love it all. It’s become an unquenchable passion that has added another layer of happiness to my life. Reason #3: We become what we think and believe and immerse ourselves in. I’m surrounded by ideas that promote happiness and spend lots of time reading about it, thinking about it, writing about it and applying its principles to my life. The more I tread in the waters of happiness, the more its liquid seeps into my bloodstream. Reason #4: Blogging has stretched me. I’ve come to think more deeply and clearly and have extended myself into uncomfortable areas doing what I’ve never done before. As I grow and develop new skills and hone embryonic talents, my happiness grows as well. Reason #5: Because happiness matters, my role in its explication and promotion adds deep layers of meaning and purpose to my life. Reason #6: As I read comments and emails from those who have found value in what I do and have taken the time to tell me, my sense that I am serving others, providing them with inspiration and answers and a way out of their challenges grows. As a result, so does my personal happiness. Reason #7: Blogging has also added loving and lovely people to my life who share aspects of my passion and work. They inspire me. They have befriended me and I have brought them into my heart as well. And so my happiness has been compounded by blogging many times over. Blogging has become an important part of my life, adding meaning and purpose and creative expression to it. It also allows me to send a little piece of me out into the world , that just may improve a life or two. Half of that goal has been met. It has improved my life. So we’re back to my original question: Are you a happy blogger? What about blogging adds to your happiness? What doesn’t? If you’re a non-blogging reader, have bloggers helped you with your happiness? How? Check out our FB page here. Then follow us by liking the page to get daily inspirational thoughts delivered to your timeline. I am a pretty happy blogger. I enjoy writing posts and enjoy having wrote. I like interacting with other bloggers. I agree that stats can make you disappointed. I try not to look at them too much and not care because it will probably never be enough, so why bother. Blogging has also helped stretch me. I’ve shared parts of myself that I never would have shared. Thanks for the post. I love the picture haha. I’m with you, Sebastian. I read that a serious blogger who wants to make his blog a business needs to know his stats, but truth be told, I haven’t looked at mine in a while. Also true about sharing parts of myself I wouldn’t have otherwise. I suppose I can be a private kind of person, so putting myself out there has been a stretch for too. 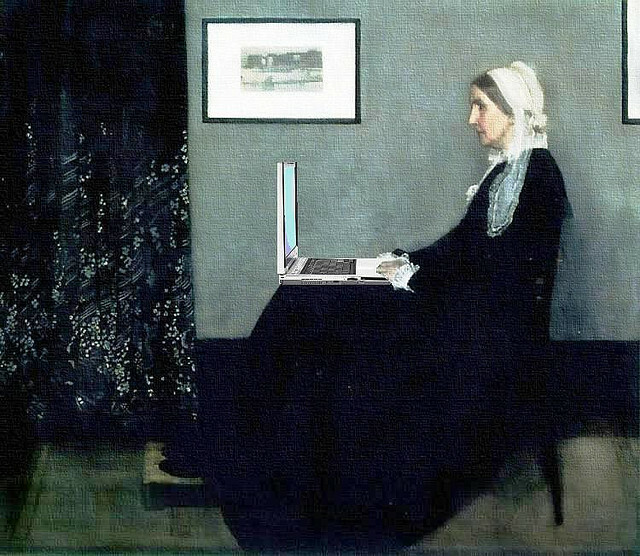 As for the picture, someone out there has lots of free time, because there are quite a few famous paintings with laptops added. When I saw them, I knew I had to use one! I guess that can be considered true. I try to only look at it once a day. I am private also. I suppose that is the writer in me. I’m glad you have put yourself out there. It is helpful. Haha. I’ll have to look into them. Yes. There is a lot of random stuff that people create her on the world wide web. Love it, Lisa! While I guess I jumped into b logging intentionally, one of the side-benefits to my thinking, writing, editing and posting, like you, has been focus and clarity. And we all know that clarity (into life, ourselves, personal obstacles, strengths, weaknesses, etc) is the first step to personal development, an essential characteristic to happiness. While recently in Crete, Greece on a once in a lifetime bucket list vacation, I met a fellow blogger who blogs about living life fully and though I do not speak much Spanish and her not much English we were able to communicate our love of blogging to each other! I’m so glad I just found your site! I’m just starting out and found that there are so many positives already! and yes, I’m looking at my stats but not getting discouraged yet since it’s all so new but I will definitely be keeping all this in mind. I’d say that connecting with people is my most favourite part so far… thanks again! I couldn’t agree more, blogging paves way to helping other people, motivating, encouraging, guiding and most of all, showing how to transform life to its fullest. Thanks for sharing. Really great! Yes I am! Writing what I feel and what I am interested in makes me happy. Being able to share it with others is even greater.